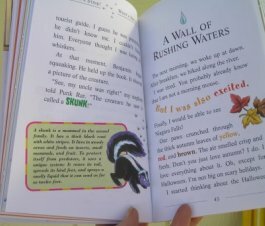 If your child struggles with reading, and you're eager to find some easy chapter books, take a look at these. They might be just what you’re looking for! Getting boys to read isn’t always easy. I should know, since my son is one of those over-active boys who would MUCH rather be running and climbing outdoors than sitting on a chair indoors with a good book in his hands. 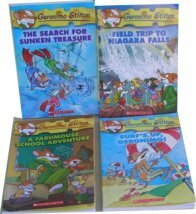 But there are a few books that can get even young boys interested in reading, and books from the Geronimo Stilton series are among them. Geronimo Stilton is a journalist, but he’s also a mouse. And he’s the star of over 40 easy chapter books. These books appeal to both boys and girls, but since boys are often more selective about the books they read – and prefer lots of graphics and action in stories – I consider this series to be an especially good one for boys. Plus, I have first-hand experience with two boys who definitely DO love these books. 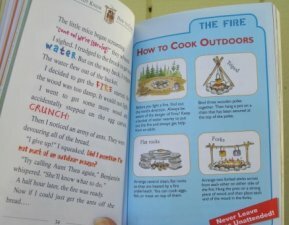 Kids Learn About Cooking, Skunks, Geography . . . and More! I came across this series of easy chapter books through a student I was tutoring in Language Arts. He was doing 5th grade-level work, and I’m sure much of that was because he was an avid reader. He LOVES books! He’d already read several of the Lemony Snicket stories, and was now enjoying the Geronimo Stilton series. He showed me the episode he was currently reading: The Mysterious Cheese Thief. In the interest of reading a couple myself and then reviewing them, I ordered a few of these books myself. My 5th grade son agreed to read one, not expecting to like it at all. He couldn’t put it down! Field Trip to Niagara Falls was a lot more interesting than he’d expected! Geronimo Stilton is a journalist ... but not your normal type of journalist. I mean, how many mice do you know that can write? He’s the editor of The Rodent’s Gazette. This page on Scholastic.com also links to book reviews of each book in the series. You can see the entire list of books, along with a brief overview of the whole cast of characters, here. The main website for this mouse journalist is fun to explore, too.The person behind the mouse (i.e., the author) is Elisabetta Dami, who lives in Milan, Italy. The publisher is Edizioni Piemme, also based in Italy. For information on other easy chapter books, see my Chapter Books page.